The Del Mar Racetrack was a colorful place to work when I was in my early twenties. Most of the people I worked with were there to bet on the horses, or as they put it, “help feed” them. Their morning began by marking up the day’s racing form. It was hard not to get caught up in the thrill of the win. You could feel the excitement rise before each race as the clock ticked closer and closer to post time. There were lines of anxious people at the windows trying to get their bets in before the bugle call. The roar would reach a crescendo and suddenly end. As the winner was announced you could see a cloud of losing tickets being thrown in the air. One day a carafe of hot coffee spilled down the back of my leg. I was sent to the infirmary. As I sat there with an ice pack on my leg, I watched my horse come in. I won the daily double that day, it was the first time I had bet on a horse and not only that I got to watch the whole race from a comfortable bed while screaming at the TV. That was it—I was hooked! One of the best places to eat at the track was the backside. That was where the horses were boarded and the jockeys spent most of their day, as well as the exercise people, and all the many other people who took care of the horses. The place was noisy, dusty, and constantly busy, but the food was fresh and mostly to order. The smell as you walked in the door would be a mixture of hay, sawdust, leather boots and hats, warm tortillas, chorizo sausages, roasted and grilled meats and peppers, refried beans, and strong coffee. 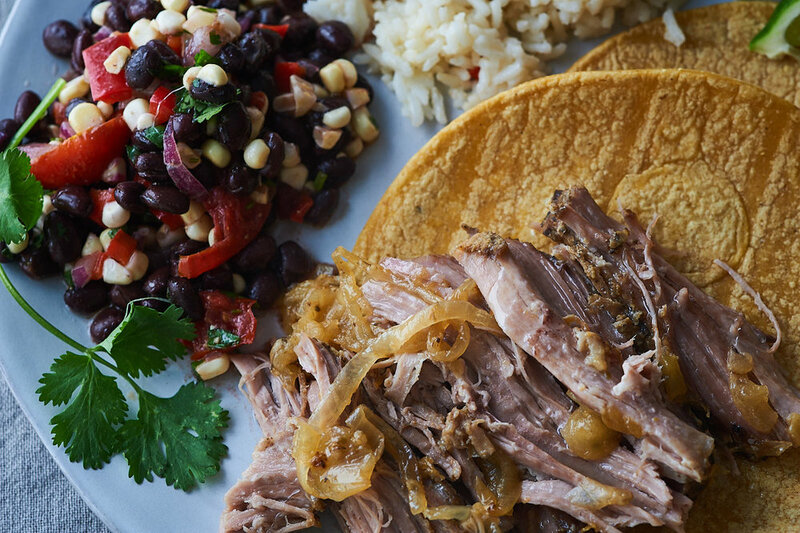 One of my absolute favorites was a plate of roast pork with black beans, rice and freshly made tortillas. That dish satisfied all my cravings of salty, crispy meat, grilled onions and peppers, with hints of citrus and fresh cilantro sprigs in every bite. This dish brings back those memories. Enough for a perfect autumn dinner and tacos the next day. Marinate it overnight and then roast it for a couple hours. The house will smell fantastic and you will be hard pressed to wait for everyone to get to that table before you dig in. In a mortar and pestle add the garlic, salt and cumin. Grind to a paste and then add the marjoram and oli. Blend the mixture until combined. Set aside. Place the pork in a nonreactive container that fits the pork comfortably. Using your fingers, rub the garlic mixture all over the pork, massaging the mixture into the roast. Juice all the citrus and pour it over the pork. Cover and place in the fridge overnight. Thinly slice the onions and place them in the bottom of a casserole dish large enough to hold the pork. Take the pork out of the marinade and place it on top of the onions fat side up. Save the marinade. Cook for 40 minutes with the lid off. Turn the pork so that the fat side is on top of the onions and cover and reduce the heat to 350°. Cook the roast for an hour. Check the roast; if there is any liquid in the bottom pour it off and place the pork back in the oven with the lid on. Place the marinade in a saucepan and simmer about ten minutes. Add a ladle of marinade over the pork replace the lid and cook another two hours. Check every so often and add a bit more marinade if needed. Serve with black beans and tortillas. Rancho Gordo’s Midnight black beans are the best! Presoak 4 hours and then pressure cook for 20 minutes. Yum.